Darapladib (SB-480848) is a reversible lipoprotein-associated phospholipase A2 (Lp-PLA2) inhibitor with IC50 of 0.25 nM. Phase 3. Blackie JA, et al. Bioorg Med Chem Lett. 2003, 13(6), 1067-1070. Wilensky RL, et al. Nat Med. 2008, 14(10), 1059-1066. Acharya NK, et al. J Alzheimers Dis. 2013, 35(1), 179-198. U73122 is a potent phospholipase C (PLC) inhibitor, which reduces agonist-induced Ca2+ increases in platelets and PMN. 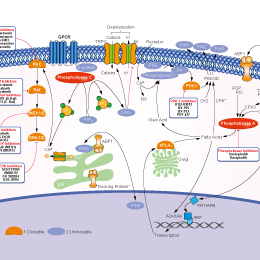 Liproxstatin-1 is a potent ferroptosis inhibitor with an IC50 of 22 nM. 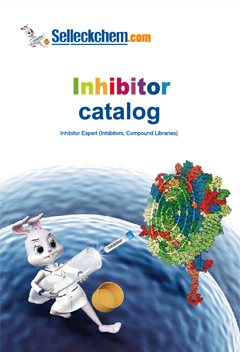 Epacadostat (INCB024360) is a potent and selective indoleamine 2,3-dioxygenase (IDO1) inhibitor with IC50 of 10 nM and displays high selectivity over other related enzymes such as IDO2 or tryptophan 2,3-dioxygenase (TDO). Varespladib (LY315920) is a potent and selective human non-pancreatic secretory phospholipase A2 (hnsPLA) inhibitor with IC50 of 7 nM. Phase 3. Features:A potent and selective secretory phospholipase A2 inhibitor. Tanshinone I, an active principle isolated from Salvia miltiorrhiza (Danshen), is structurally similar to tanshinone IIA and may possess similar cytotoxic effects on tumor cells. Polydatin is a crystal component extracted from the root stem of perennial herbage Polygonum Cuspidatum Sieb.et Zucc. Halobetasol Propionate is an anti-inflammatory and a dermatologic agent commonly used to treat psoriasis. Clofazimine is a rhimophenazine dye, originally developed for the treatment of tuberculosis, it has both antimicrobial and antiinflammatory activity, postulated mechanisms of action include intercalation of clofazimine with bacterial DNA and increasing levels of cellular phospholipase A2. Features:Intracellular activities of Clofazimine are superior to that of B4154. Erastin is a ferroptosis activator by acting on mitochondrial VDAC, exhibiting selectivity for tumor cells bearing oncogenic RAS. INCB024360 analogue is a potent, competitive IDO1 (indoleamine-(2,3)-dioxygenase) inhibitor with IC50 of 67 nM. Phase 2.